When Freeman Hrabowski was a 12-year-old boy living in Birmingham, Alabama, his parents made him go to church in the middle of the week. Like any little kid, he didn’t want to go. So his parents placated him with peanut M&Ms and his favorite activity — math. As he sat in the back of the church eating candy and solving math problems, he began to feel inspired by the words of that night’s speaker — Martin Luther King Jr. In fact, a young Hrabowski was so inspired, he decided he wanted to join King’s Children’s Crusade march for civil rights. At first his parents said no — they were too worried for his safety. Young Hrabowski called them “hypocrites” and was promptly sent to his room. The next morning, his parents, after praying on the issue throughout the night, had changed their mind and let their son join the march. Unfortunately, Hrabowski was swept up in a mass arrest, but he gained an “empowering and painful” experience, he said. As Hrabowski stood before thousands of public health practitioners at today’s Opening General Session in Chicago, he said he realized all those years ago that each of us could shape our futures. “Children can have an impact on their own destiny,” he said. 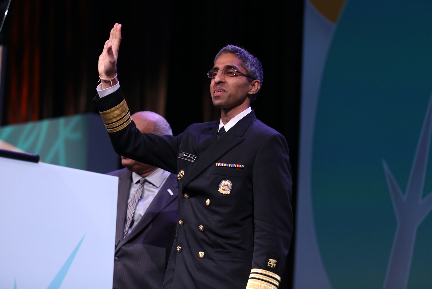 That idea of destiny was a common theme at today’s opening session, especially in light of APHA’s goal to create the healthiest nation in one generation and its new movement to make that goal a reality — a movement we call Generation Public Health. (But more on that in a minute.) Unfortunately, many people feel like their “health is less and less in their hands, and this has to change,” said opening session speaker U.S. Surgeon General Vivek Murthy. Murthy said there are three elements central to our work as public health leaders: information, inspiration and equality. “In these three elements lies the key to fulfilling the ultimate mission of public health,” he said. For instance, in an era when half-truths and misinformation can spread halfway around the world with just a keystroke, “what we communicate matters,” Murthy told attendees. With so many questions about electronic cigarettes, healthy diets, how to protect kids from drugs and so much more, public health must modernize its approach to sharing information. And, Murthy said, we can no longer rely on running public service announcements in traditional media — we have to be creative, find new messengers and take information to where people are. Of course, good communication is just one piece of the puzzle. “Health has to be woven into every strand of public policy,” Murthy said. Murthy called on attendees to better understand what transforms someone from feeling powerless over their health to someone who feels empowered to make a difference for themselves and others. The real conundrum, he said, is moving people from “pessimism to possibility.” When we in public health can inform and inspire others to improve health, that’s when we can create a new movement, Murthy told attendees. Public health workers in Illinois and Chicago are certainly working hard to transform the health of their own communities. Nirav Shah, director of the Illinois Department of Public Health, joined the opening session stage to welcome Annual Meeting attendees to the Windy City and encourage folks to take advantage of the city’s great walking trails and restaurants. Looking out at the audience, he concluded that “public health is alive and well in this country.” In public health, he said, there are no insiders or outsiders. Just a community of people who care and advocate constantly to redefine what is unacceptable in our society. Unfortunately, not all is rosy in the Land of Lincoln. Miriam Link-Mullison, president of the Illinois Public Health Association, told attendees the state is in fiscal crisis, with budget cuts to public health for more than five years. In fact, Link-Mullison said she and her colleagues are now 123 days into a fiscal year without a state budget, with no continuing resolutions. Without a state budget, the entire public health system is in jeopardy — since July, 36 percent of local public health agencies have cut staff, services or hours that they’re open to the public. She said the hardest hit agencies are those with limited local support, those serving rural communities and those in communities with high rates of poverty. That’s why she asked attendees for their crucial support. Link-Mullison encouraged the audience to stop by the IPHA booth at the Public Health Expo and pick up an “I Support Illinois Public Health. Pass a Budget Now” sticker and sign their petition calling for a responsible budget that protects public health. There’s no doubt that many local public health practitioners out in the audience could identify with her experience and call to action. “Working together is what this conference is all about,” she said. 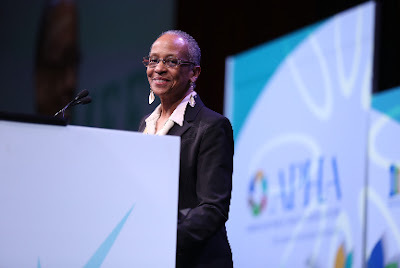 Working together was a central message from APHA President Shiriki Kumanyika, too. She called on audience members to engage in the Generation Public Health movement and sign the Generation Public Health pledge. Go beyond the practice of public health and leverage the passions that brought us to the field to build a movement and keep it moving forward, she said. No matter your age, whether millennial or baby boomer, “let’s all be in the same generation,” Kumanyika said. John Lumpkin, senior vice president and director of Targeted Teams at the Robert Wood Johnson Foundation, also called on the audience to help elevate health as an “esteemed social value.” In fact, just today, the foundation launched its new Culture of Health website, which calls on stakeholders to improve the health and well-being of everyone in America. On to one of the most pressing public health issues of our time: climate change. 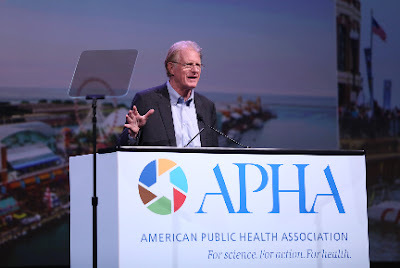 Actor Ed Begley Jr., who’s on the board of ecoAmerica, told session attendees about his life as an environmental advocate, from driving an electric car in 1970 (which he said was more like a golf cart with windshield wipers and horn) to bicycling and composting. Begley emphasized that the “environment is a public health issue,” noting that actions that reduce climate change are not only good for our health, but often benefit our pocketbooks as well. In honor of the 70th anniversary of community water fluoridation, APHA Oral Health Section Chair Kathy Lituri noted that the oral health benefits of fluoridation have promoted health equity. But in the face of continuing misinformation about fluoridation, Lituri called on audience members to take three action steps: every local and state health department should offer credible fluoridation information on its website; every school of public health, medicine, nursing and social work should provide credible fluoride info to its students; and all of us should strive to educate our neighbors, community leaders and policymakers on the great benefits of fluoridation. In talking about the need for collaboration between public health and education and the coming 50th anniversary of the Higher Education Act of 1965, Hrabowski asked the audience a few questions about college graduation rates in the U.S. (Good to note here that education is a key determinant of health, well-being and life expectancy.) Did you know, he asked, that in the early 1960s, only about 10 percent of Americans had a college degree, including just 11 percent of whites and 3 percent of blacks. Fast forward to today and 30 percent of Americans have a college degree, including 37 percent of whites, 19 percent of blacks and 14 percent of Hispanics. However, one group that hasn’t seen a lot of progress, he said, are people living in the lowest-income households. To that end, Hrabowski said we must do more to help children living at the bottom of society to achieve academic success. Hrabowski called on the audience to ask this transformative question: Who would you be if you hadn’t been fortunate enough to get an education? Think about that question, he compelled us, and then ask yourself: Who am I, and what responsibility do I have to other people? He ended his keynote speech with a story about his mom at a time when she began to struggle with dementia. Though her mind may have been foggy, she imparted this lesson that Hrabowski shared with the audience: “I now understand that teachers touch eternity through their students,” she told him. 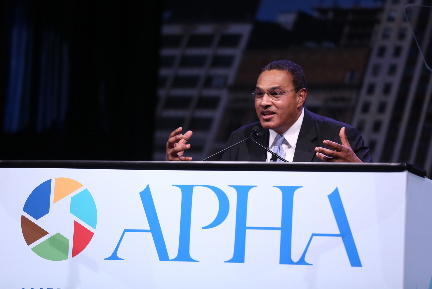 Visit APHA’s YouTube channel for video of Hrabowski’s keynote speech.